A French painter, he was born into a peasant family in the Sundgau and received his first artistic training at Altkirch with Charles Goutzwiller (1810–1900) and later in Strasbourg in the studio of Gabriel-Christophe Guérin (1790–1846). In 1846 he enrolled at the Ecole des Beaux-Arts in Paris as a pupil of Michel-Martin Drolling and, from 1851, of François-Edouard Picot. While a student he was particularly drawn to portraiture, and during his frequent visits to Alsace he made portraits of his family as well as of the notables of the region. He also painted scenes of Alsatian peasant life (e.g. Marie-Ann Henner Churning Butter, 1856; Paris, Mus. 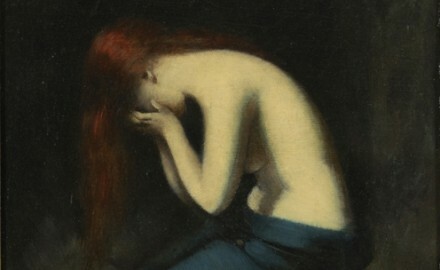 Henner). Although he painted history and portraits, he is probably best known for his prostrate nudes in dreamy landscapes rendered in murky chiaroscuro.